Governments use various tools to promote scientific research, and the resulting innovations or knowledge can cross borders. This column examines whether governments and organisations adjust their funding of medical research in response to the funding decisions of others. The results suggest an increase in US government funding is associated with a decrease in funding by others. While this evidence is consistent with free riding, qualitative evidence suggests it reflects the optimal reallocation of funds. Businesses tend to underinvest in scientific research because it is a public good, so governments use patents, innovation prizes, R&D tax credits, and direct funding of R&D through grants to promote scientific research. The resulting innovation or knowledge can cross borders, potentially causing other governments to alter their own innovation policies. We examine whether spending on basic medical research by one government affects spending by others. Economic theory suggests that governments will respond to one another in funding decisions (Lee 1988, Nordhaus 2015, Olson and Zeckhauser 1966). However, we have little evidence for this phenomenon outside of national defence spending (Murdoch and Sandler 1984, Sandler & Murdoch 1990) and environmental regulation (Murdoch and Sandler 1997). In our recent work, we investigate whether governments respond strategically to one another in funding basic medical research (Kyle et al. 2017). We focus on infectious and parasitic diseases because of the enormous impact of the diseases on human welfare. Infectious diseases were four of the top five priorities (nutrition being the fifth) for the Copenhagen Consensus of 2012, during which an expert panel, including four Nobel laureates, set priorities for advancing global welfare. We use data on research funding for 15 infectious and parasitic diseases across 41 countries and organisations from 2007 to 2014, collected annually by the non-profit Policy Cures. Simple analysis suggests a positive relationship across funders because the same factors, including burden of disease, motivate funders. We use instrumental variables to address the endogeneity of funders’ decisions. Specifically, we argue that changes in the composition of US Congressional committees shift US spending, but are exogenous to the decisions of other governments. We find that a 10% increase in US government outlays for medical research is associated with a 2–3% decrease in outlays by other government agencies or non-governmental organisations (NGOs) in the following year. We also find that other governments and NGOs respond to US funding only if they are already funding the disease. It is rare for a government agency to stop funding a disease entirely in response to an increase in US outlays, or begin funding a new disease in response to a decrease in US outlays. Government agencies tend to fund diseases with a high local burden, and respond to US outlays more intensely for such diseases. In other words, changes in US outlays primarily affect the intensity of funding rather than the extent of funding (choice of diseases). The negative relationship between US government funding for a disease and funding by other governments, NGOs, and foundations is consistent with free riding. 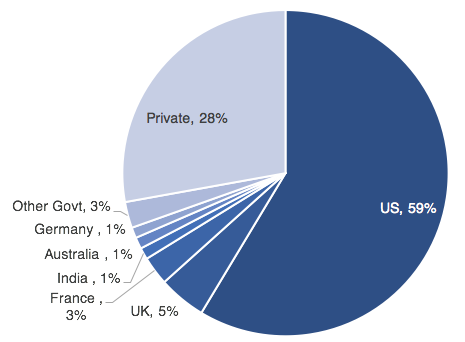 We also find that the US government provides more than half of global government and foundation funding for research on infectious and parasitic diseases (Figure 1). 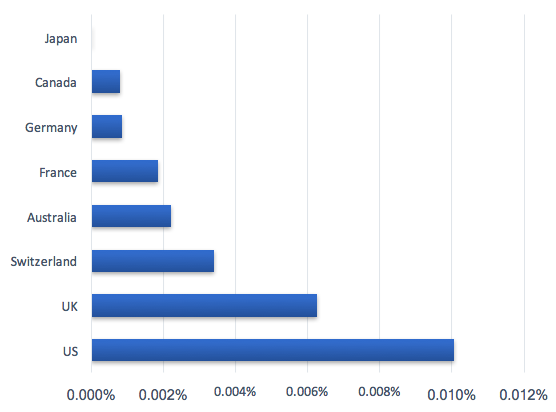 Not only is US funding high in absolute terms, but also relative to national income. US medical research spending as a share of national income is triple that of other high-income countries except the UK (Figure 2). While much of our evidence is consistent with free riding, the evidence might also be consistent with optimal reallocation. For example, the government of Brazil might shift funding away from HIV because of high US funding for HIV, and concentrate that funding on diseases with a high burden in Brazil relative to other countries, such as dengue. 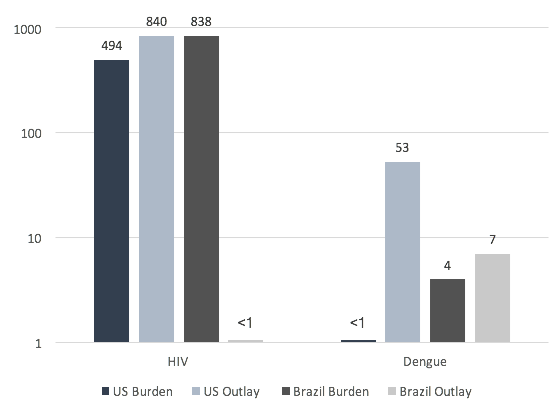 The government of Brazil provides less medical research funding for HIV than for dengue, even though HIV has a larger burden, perhaps because the US already provides so much funding for HIV research (Figure 3). Conversations with people at NGOs suggests that reallocation is at least part of the story. According to a program officer of the Burroughs Wellcome Fund, “[w]e avoid funding areas that the federal government is funding in order to focus on the underserved. This is how many of our philanthropic peers operate. For example, when the NIH developed its translational science programs, we retired ours.” Likewise, asked about the objectives of the Gates Foundation, an employee wrote, “the primary driver is perceived neglect and opportunity for impact in a disease area which brings together both health impact and other donor support”. The Congressionally Directed Medical Research Programs Review Process in the US is tasked with identifying and avoiding duplicative research funding, but focuses primarily on avoiding overlap across US government agencies and with NGOs; in fact, a recent evaluation of this process makes no mention of non-US funding (National Academies of Sciences, Engineering, and Medicine 2016). Note: Disease burden is measured in thousands of disability-adjusted life years lost. Mean research outlays are measured in millions of US dollars. Governments and NGOs might have other objectives that we do not consider, including a desire to fund research at favoured institutions (Hegde 2009, Hegde and Mowery 2008) or to show progress fighting a disease. Also, there might be other frictions that mute awareness or action on funding changes. Regardless of whether these responses represent free riding, optimal reallocation, or crowding out, when the US government increases outlays for research on a disease by one dollar, the global increase (net of foreign reductions) is smaller. We estimate an increase in net international outlays of 70 to 80 cents when the US government allocates one additional dollar to research on a disease. Documenting government responses to changes in medical research funding outlays is relevant to both research and policy sectors. First, academic research that estimates of the impact of one additional dollar of NIH funding could underestimate the effect, because the net increase in funding for that disease will be smaller due to responses by other governments or funders. Policymakers should be aware of how governments adjust funding and consider enhancing international coordination. Given that some of the evidence is consistent with free riding and given that some of the reallocation might not be globally optimal, governments should increase efforts to coordinate on medical R&D as they do in other areas, such as military defence and environmental regulation. Hegde, D (2009), "Political influence behind the veil of peer review: An analysis of public biomedical research funding in the United States", Journal of Law and Economics 52(4): 665–690. Hegde, D and D C Mowery (2008), "Politics and funding in the US public biomedical R&D system", Science 322(5909): 1797–1798. Kyle, M K, D B Ridley and S Zhang (2017), "Strategic interaction among governments in the provision of a global public good", Journal of Public Economics 156: 185–199. Lee, D R (1988), "Free riding and paid riding in the fight against terrorism", American Economic Review 78(2): 22–26. Murdoch, J C and T Sandler (1984), "Complementarity, free riding, and the military expenditures of NATO allies", Journal of Public Economics 25: 83–101. Murdoch, J C and T Sandler (1997), "The voluntary provision of a pure public good: The case of reduced CFC emissions and the Montreal Protocol", Journal of Public Economics 63: 331–349. National Academies of Sciences, Engineering, and Medicine (2016), Evaluation of the Congressionally Directed Medical Research Programs Review Process, Washington, DC: The National Academies Press. Nordhaus, W (2015), "Climate clubs: Overcoming free-riding in international climate policy", American Economic Review 105(4): 1339–1370. Olson, M and R Zeckhauser (1966), "An economic theory of alliances", Review of Economics and Statistics 48(3): 266–279. Sandler, T and J C Murdoch (1990), "Nash-Cournot or Lindahl behavior? An empirical test for the NATO allies", Quarterly Journal of Economics 105(4): 875–894.